A bald eagle found caught in a hunter's trap was released - very carefully - by a New Hampshire police sergeant. The bird was discovered by a pair of hunters last Thursday. The hunters contacted police in Salem, N.H.
"I was on on call and spoke to the hunter," Sgt. Mike Wagner told ABCNews.com. "But I didn't believe it was an eagle. In my 41 years on Earth I've never seen a bald eagle in the wild." 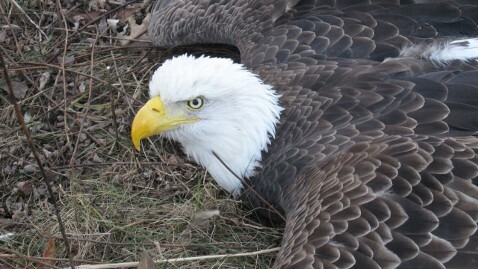 Wagner arrived at the scene and found a bald eagle stuck in a snap-type trap. "I threw a blanket over it and it seemed to calm down. Then we unsprung the spring-loaded trap and got the bird's talon out," the sergeant said. The eagle seemed largely unharmed, Wagner said, and as soon as soon as it was pried loose from the trap it flew away. "We got him out and he never even hit the ground, just flew right up into a tree," he said. Also in the trap was the skinned carcass of a beaver, which presumably attracted the eagle. Though claw traps are legal in New Hampshire, Wagner was initially worried that this particular trap was unsafe due to its location near a populated street. But after contacting fish and wildlife authorities, he's concluded that the trap was being used in accordance with area gaming laws. "And I don't think they were trying to cause any harm. I just don't think in a million years anyone could have ever expected a bald eagle to wind up in the trap."